1. A conference or other meeting for discussion or training. 2. A class at a college or university in which a topic is discussed by a teacher and a small group of students. 1. a. A small group of advanced students in a college or graduate school engaged in original research or intensive study under the guidance of a professor who meets regularly with them to discuss their reports and findings. 2. A meeting for an exchange of ideas; a conference. Note the common theme above that a seminar or conference has as a prime ingredient the concept of participation and exchange of ideas. It is more than just a professor or teacher sharing his or her expertise on a subject, which is unidimensional. A seminar in its highest form provides a forum by which the participant interacts with the information giver in some way. It is generally conceded that the most effective means of teaching is when the student and teacher have some kind of interaction. We must not underestimate the value of these conferences and seminars as a means for providing tools to those who need them. My wife Cynthia is a professional marriage therapist. About once a year she attends a major conference of the American Association of Christian Counselors (AACC). About 4000 counselors have already registered for the upcoming annual event in Nashville. The best of the best will make their presentations, and each attendee will have opportunity to interact personally (as much as possible given the sheer number of people attending) in a break-out session on the subject of their choice. I know Cynthia and our daughter Tricia (who is also a counselor and will attend) will return from the AACC event with new ideas, concepts, and enhancements for their ministries. •	Extremely valuable to provide specific training on focused subjects. In recent months great reports have returned to us about the value of church planting boot camps, human trafficking seminars, Royal Ranger leadership training, King’s Castle outreach workshops, teacher training seminars, unreached-people-group awareness conferences, praise and worship seminars, security training, children’s outreaches, and literally dozens of other gatherings that help us be more aware and to concentrate resources more effectively in areas of ministry. We have more tools to work with than before. •	Effective tools, because they are led or coordinated by experienced, informed, and passionate leaders with a focus on one aspect of ministry. Virtually any subject can be the topic for exploration and investigation. With guidance and input from those who are experienced, one can quickly advance in understanding and motivation in specific areas of training. 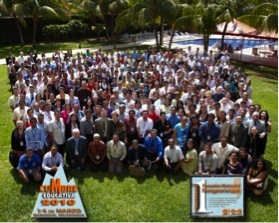 What a treat in 2010 to attend two educators’ seminars in Nicaragua and Chile with a total attendance of nearly 700 educators who have a passion to learn from each other and from those who challenged us! •	The time- or money-conscious students can usually go, get it done, and return with that tool in hand. No drawn-out process, just get it done. These events do not replace long-term courses, but they can augment and enhance one’s knowledge base. •	Generally the attendees at such a seminar or conference are there because of interest, and not just because it is a required course. Obviously, we all need to be well-rounded and not just take classes or seminars that we like and nothing else, but at least these tools we obtain are interest-based and thus tend to be personally rewarding with an inherent promise of long-term follow-up. •	With advanced planning and reasonable promotion, a conference or seminar on a particular subject tends to coalesce the participants around a common interest, which, with today’s technology, inevitably provides the opportunity for networking, linking, and connecting the dots for future action. •	With a multitude of electronic tools at our disposal, just about any theme is open to us. Research capabilities are at our fingertips, as quick as a Google search or an e-book download. PowerPoints, flash drives, electronic referencing, and wireless interchange are gifts to those hungry for knowledge. We are connected in ways we never dreamed possible, and the future opens up to those who gather together around common-interest topics for personal edification and greater understanding. Let us all take advantage of the huge opportunities we have today through conferencing to become better equipped for the challenges of today. Don’t hesitate to suggest or organize interactive events such as seminars or summits. I truly believe something dynamic happens when people gather around common interests and causes, seeking to improve themselves and their ministries. We who teach are attentive to the mandate to “do your [our] best to present yourself to God as one approved, a workman who does not need to be ashamed and who correctly handles the word of truth” (2 Timothy 2:15, NIV). Workers need the newest and best tools, as well as the trusted and reliable ones one is accustomed to, to be the most effective. Seminars and conferences can provide these tools. You are right on… “I truly believe something dynamic happens when people gather around common interests and causes”! Iron sharpens iron. The international conferences and seminars help us see way beyond our world. Thanks for encouraging us to facilitate and participate in these forums. I am thankful that AGWM provides many opportunities to network through seminars and allows us to use work funds to sharpen our skills. It is easy to take for granted all of these opportunities. 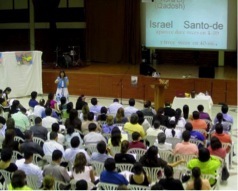 My favorite seminars-meetings are ACLAME and MISIONES EN CONJUNTO. Thanks for the panoramic and at the same time incisive view of seminars, which make us value them more. How off the mark the facile and flippant “one more seminar” comment is shown to be. The interchange enhances us all when the passionate and the prepared present a seminar. The Cumbres Educativas have been especially useful.